The outbreak of the First World War found Robert and Sonia Delaunay vacationing in the Spanish resort of San Sebastián. After spending some time in Madrid, they lived from June 1915 to March 1916 in the Portuguese village of Vila do Conde, near Oporto. Both painters were fascinated by the warm, clear light of northern Portugal, which they captured in a series of paintings of country markets. 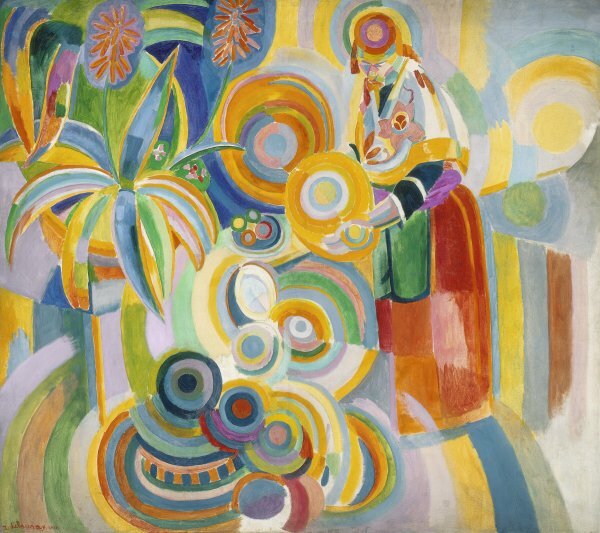 Although Robert Delaunay had ventured into abstract art in 1912–13, unlike other painters, such as Kandinsky and Kupka, he never saw abstraction as an end in itself. Here, figurative and abstract elements merge to enhance the dynamic arrangement of colour. Delaunay maximised colour saturation by mixing oil with wax, a technique he abandoned after his stay in Portugal. Robert and Sonia Delaunay were spending the summer in San Sebastian at the outbreak of World War I, in August 1914. The fact that Robert had been declared unsuitable for military service on medical grounds in 1908 enabled them to remain in Spain, which was a neutral country; their choice was reinforced by their internationalist and pacifist convictions. In the autumn of that year, the Delaunays moved to Madrid, where they stayed until June 1915; then, after travelling to Lisbon, they decided to settle in Vila do Conde, near Oporto. They remained there until March 1916, and, after another sojourn in Spain-in Vigo-they returned to Portugal and lived in Valença do Minho until the beginning of 1918, when they moved back to Madrid. During their long stay in Portugal, Robert and Sonia Delaunay contributed decisively to the activity of the Orfeu group, a Portuguese offshoot of Simultaneism, promoted in 1913 by Apollinaire and Delaunay in Paris with the ultimate aim of constructing the artistic equivalent of modern man's vital experience. The incomes they were receiving from their respective families (and which, in Sonia's case, ceased at the end of 1917 due to the Russian Revolution) allowed them to dedicate themselves fully to painting. Thus, their stay in Portugal was one of the happiest and more fruitful creative periods of the Delaunay couple. Although in 1912 and 1913 Robert Delaunay had executed entirely abstract paintings-in the sense that they totally lacked figurative references-for him abstraction did not so much have an artistic value per se (as it had for Kandinsky and Kupka), as an instrumental value to be used within Simultaneism. The larger and more ambitious pictures painted by Delaunay in the years after his discovery of abstraction, beginning with the famous Homage to Blériot of 1914, are figurative, although they include areas conceived as abstract paintings. "Robert and I had the opportunity to observe the laws scientifically discovered by Chevreul [...] in nature when we were in Spain and Portugal, where the radiation of light is purer, less misty than in France", wrote Sonia Delaunay. Similarly, Robert stressed the importance of the Portuguese experience. "After the cold and transparent light of Madrid comes a series of paintings, studies executed under the more humane and closer sun of Portugal. A country in which, as soon as we arrived, we felt enveloped in a dream-like atmosphere, of slowness [...]. Violent contrasts of splashes of colour in the women's dresses, of the multicoloured shawls with the cool and metallic greens of the watermelons. Shapes, colours, women that disappear among mountains of pumpkins, of vegetables, in the markets enchanted by the sun [...]". The works painted by Robert and by Sonia Delaunay in Vila do Conde were a response to this evocation. All of them are based on the experience of the rural market and are interrelated as a systematic series of studies culminating in three large format pictures intimately linked to each other: La verseuse (Habasque, no. 189), belonging to the Musée national d'art moderne, Paris, Portuguese Still Life (Habasque, no. 186), belonging to the Musée d'Art Moderne de la Ville de Paris, and Portuguese Woman (Tall Portugese Woman) (Habasque, no. 177), which we are analysing here. The first one, slightly smaller than the other two, is also the more figurative. Portuguese Still Life and Portuguese Woman (Tall Portuguese Woman) have a similar format and composition, and only differ in the figure depicted in the second, referred to in the title. The peculiar effect of chromatic saturation emanating from the pictures painted by Delaunay in Portugal is due to the use of a special technique, a variation of the encaustic method, in which the pigments are mixed with oil and wax. This technique, which the Delaunays had learned in Paris from the Mexican painter Zárraga, also guarantees a greater persistence of the luminosity of the colours, although its practice is slow and difficult, and the Delaunays abandoned it after their stay in Portugal. The painting analysed here appears with the title Portuguese Woman in Habasque's catalogue and in all the bibliography before 1985. However, since the retrospective exhibition held at the Musée d'Art Moderne de la Ville de Paris (1985), the title Tall Portuguese Woman has become widely accepted. We have adopted it, since it can be thus distinguished from other paintings of a much smaller format, with similar or identical titles-Portuguese Women (Habasque, no. 166), Portuguese Woman (Habasque, no. 172) and Portuguese Woman (Habasque, no. 176).